"Number" is not resticted to the 3 dimensions of our physical world but spans all dimensions from zero to infinity. In any dimension there is a shape which constitutes the simplest configuration. in 0 dimensional space the point is the simplest shape. in 1 dimensional space the line is the simplest shape. in 2 dimensional space the triangle is the simplest shape. in 3 dimensional space the tetrahedon is the simplest shape. ...and so on to infinity. Of course we cannot use a different name for the simplest shape in every dimension so we use the shorthand of n-dimensional simplex. This table is a slightly modified Pascal's triangle illustrating a remarkable connection between simplices and simplex figurate numbers. 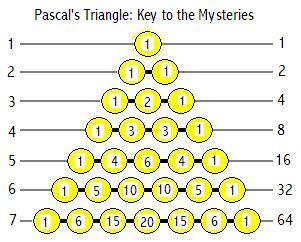 The features of a given simplex correspond exactly with a particular level of Pascal's triangle which in turn corresponds with a particular numbers' partition structure. These partition structures can be represented with binary figures. Base 2 is the simplest possible numerical system of notation. So there is a direct relation between the simplest shape, the simplest base and ways in which a number can be partitioned. The number of ways in which 5 can be partitioned corresponds with the Tetrahedron.